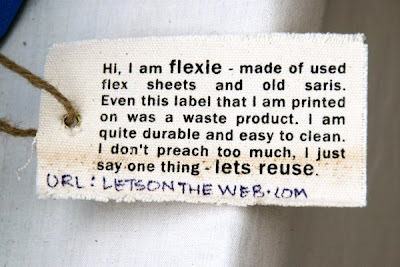 This "Green" initiative was started by Nupur Goenka in, Chennai, India. 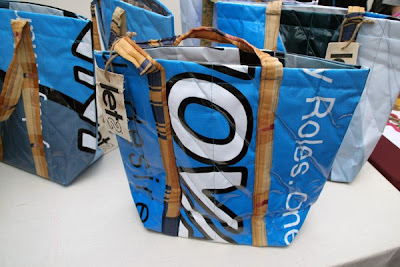 Her company, "Lets", reuses discarded materials to create one of a kind bags like the ones you will see below. 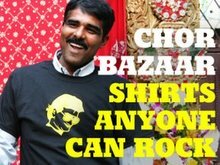 The outdoor advertising industry maintains approximately 450,000 billboard locations throughout india. The material of choice for the large highway advertising billboards is a 3-layer composite material where the reinforcement layer is coated with flexible vinyl on either side to yield the desired fabric. What happens to those huge vinyl billboards after they're taken down? For 5 years, indian designer and entrepreneur nupur goenka has been developing strategies that allow for a valuable use of produced waste. her initiative 'let's' employs 15 artisans to collect and upcycle the discarded material. A single billboard can be transformed into a small-run series of 20 handmade, one-of-a-kind totes. 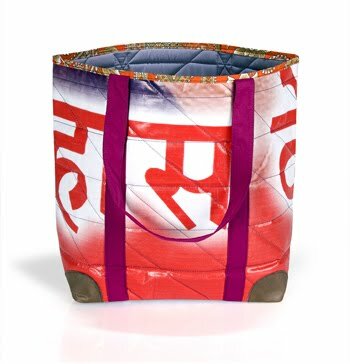 Each colorful bag is made from different cut-outs and therefore is unique. 'the 'flexie' tote which you purchase will have this color combination (shown in the images published here), but obviously cannot be exactly the same model. At $25 USD a pop these bags are a lot cheaper than the similar Swiss counterpart, Frietag. I guess one could say that there is a bit more spice to them as well. Far more than Fondue in Zurich. Now they need to create a messenger bag and she could give Frietag a run for their Swiss Franc.